Most manufacturing strategies today include some level of support from an outsourcing service provider such as a CMO or contract testing lab. There has been a great deal of discussion regarding the elevated role these providers play in the drug development process. Today’s CMO is likely to not only execute critical development activities but also provide insight based upon their own experiences with multiple processes. 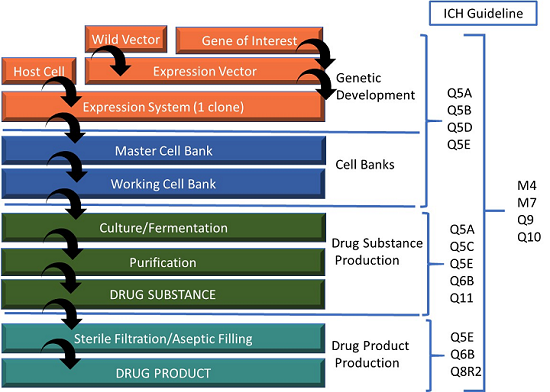 Biologic drug development consists of two fundamental components: the drug substance (DS) development, which can include the master and working cell bank development, manufacturing process development, and scale-up; and the drug product (DP) development, which includes the filling of the drug substance into the primary container. If the primary container is a medical device, such as a prefilled syringe, there is an additional step where the final drug product is placed into the final packaging tray or system to form the final combination product. While the FDA does not explicitly define the testing required as a product moves through its development life cycle, recognized standards provide guidance based upon where you are in your drug development and clinical program. Let’s focus on the considerations for building a testing strategy for a drug product when using a CMO. Distribution of several of the most commonly applied standards as they pertain to the chemistry, manufacturing, and controls (CMC) component of the drug development life cycle is shown in Figure 1. 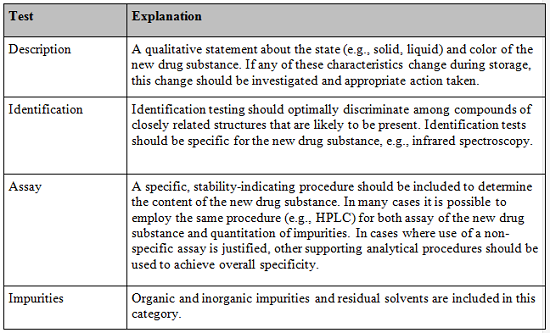 While other tests are universally accepted as described by ICH Q6, those cited above are the most applicable to large molecule DS. Another relevant standard to consider is the FDA Process Validation guidance, updated from the 1987 guidance in 2011.2 This guidance transformed process validation from an activity typically conducted at the end of the development process to a life cycle concept. The first stage of process validation is focused on establishing process understanding. Implicit in this is the establishment of an effective control strategy. controls on drug substance (e.g., release testing). The testing strategy at your CMO will reflect the drug sponsor’s CMC and quality interest for both the DS and DP. This is influenced to some extent by where you are in your overall development program. 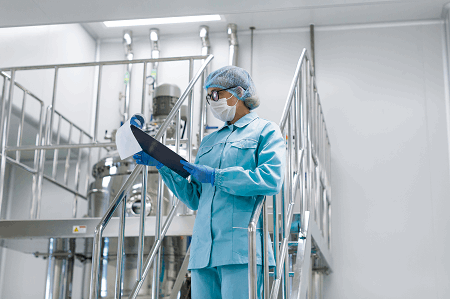 For example, when considering what testing to conduct when transferring a bulk drug substance (BDS) to a drug product CMO, the drug sponsor must consider factors which could impact the drug substance during transit and storage at the DP CMO. Also, the BDS will be shipped frozen so the drug sponsor will typically pull side samples for testing upon receipt. In addition, the CMO will want assurance that the material is suitable to process in their aseptic suites. 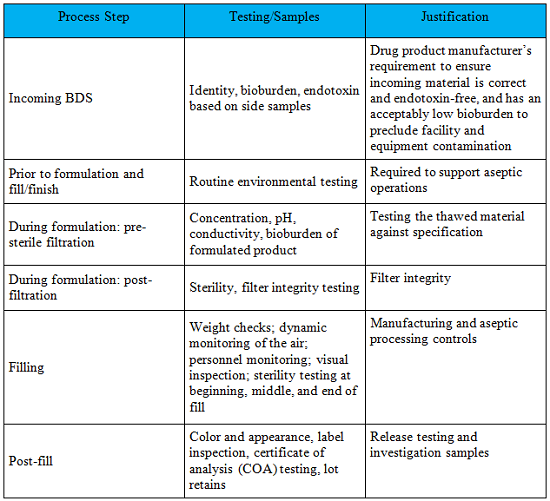 As the product moves through the manufacturing process, the testing strategy will reflect the control strategy to ensure the DW/DP safety, quality, integrity, purity, and potency. An example testing strategy is in Table 1. With the widespread adoption of outsourcing as both a development and commercial manufacturing strategy, having a clearly defined testing strategy is essential for both the drug sponsor and CMO. No explicit standards dictate a testing strategy for the DS or DP, but internationally recognized harmonized standards such as ICH Q6 provide a strong basis for developing a cogent plan based upon a universal testing strategy. In the end, the drivers for testing will be closely tied to the level of characterization performed by the drug sponsor for the DS and DP during development. Bikash Chatterjee is president and chief science officer for Pharmatech Associates. He has over 30 years’ experience in the design and development of pharmaceutical, biotech, medical device, and IVD products. His work has guided the successful approval and commercialization of over a dozen new products in the U.S. and Europe. Chatterjee is a member of the USP National Advisory Board, and is the past-chairman of the Golden Gate Chapter of the American Society of Quality. He is the author of Applying Lean Six Sigma in the Pharmaceutical Industry and is a keynote speaker at international conferences. Chatterjee holds a B.A. in biochemistry and a B.S. in chemical engineering from the University of California at San Diego.